Take a look through these Top Tips from our expert nurses, Anne Lamb-Cona and Christine Parsons, and other specialists in the field. These tips can help you make the most of ProVIS and utilise the full range of available data. To learn more about ProVIS, click here. Short on time? Focus on your top five potential over-ordering patients in the table and identify areas where you could improve patient care and reduce costs. Reviewing patients with potential over-ordering patterns could provide long-term cost savings within your CCG. Keep your ProVIS report up-to-date by contacting Fittleworth with any patients who have been reversed or no longer require products. This will ensure that your report remains accurate and valid. Print out your ProVIS report and use it in clinics to remind yourself of patients’ ordering patterns. Patients identified in the ‘Excessive Ordering’ group have the highest potential over-ordering patterns, and are most likely to benefit from re-education. ProVIS reports can identify patients who are under-using or inappropriately using their appliances, and this is particularly common for urology patients using ISC or indwelling catheters. Intervening early could help prevent unnecessary hospital admissions linked to extended product misuse, so re-education around appliance use is important. ProVIS reports show the date of your patients’ last order and you can use this as a guide to identify your active patients. This can help identify patients who have not been seen for some time and may be in need of a review. ProVIS reports identify potential patient over-ordering patterns. Use this information to tailor consultations and re-educate patients to ensure they are using their products correctly. If you find it difficult to discuss product usage with patients over the phone, wait for them to come into clinic and speak face-to-face to address any over-ordering patterns you have observed from your ProVIS report. The NHS Five Year Forward View focuses on prevention. Use your ProVIS report to identify patients who may be inappropriately using their products and call them in for a review. Intervening early could help prevent unnecessary hospital admissions caused by long-term product misuse. Be proactive with your ProVIS Progress Reports – organise meetings with your medicines management teams to show how you are using ProVIS to help reduce cost while maintaining excellence in patient care. ProVIS reports display your average monthly order values, so you can easily track trends in your prescribing spend. Presenting this information to medicines managers can help demonstrate your ability to maintain patient care while cutting costs. 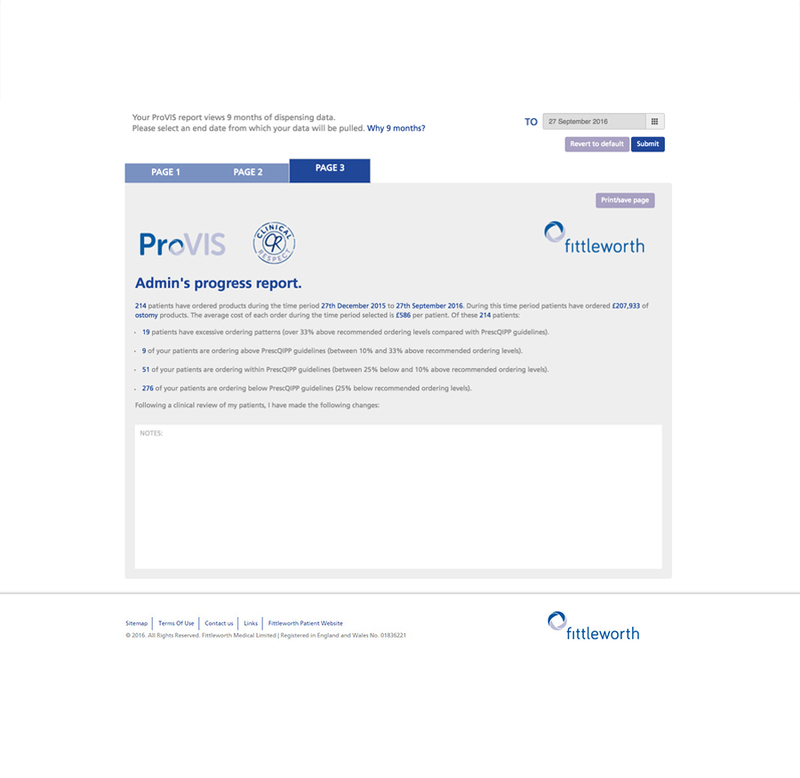 Click here to learn more about interpreting your ProVIS report and for any assistance using your report with payers, email the Fittleworth team at ProVIS@Fittleworth.com. Every nurse will find different elements of ProVIS relevant for them, so it is important to share best practice with your colleagues and learn from each other’s experiences. If you have any ProVIS Top Tips that you would like to share, email them to ProVIS@fittleworth.com. ProVIS reports display information across all the Fittleworth patients in your area and summarises this into key values on Your Dashboard. If you would like to further analyse the data available, you can download the Patient Detail page as a .CSV excel file to sort and display the information to suit your needs. 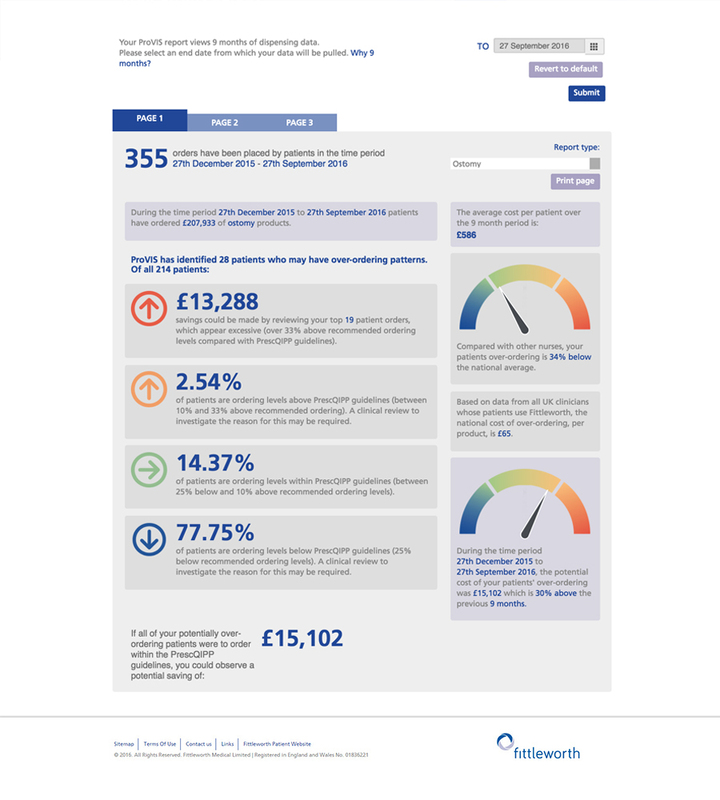 The Dashboard page allows you to compare the prescribing spend of your CCG compared to other CCGs. 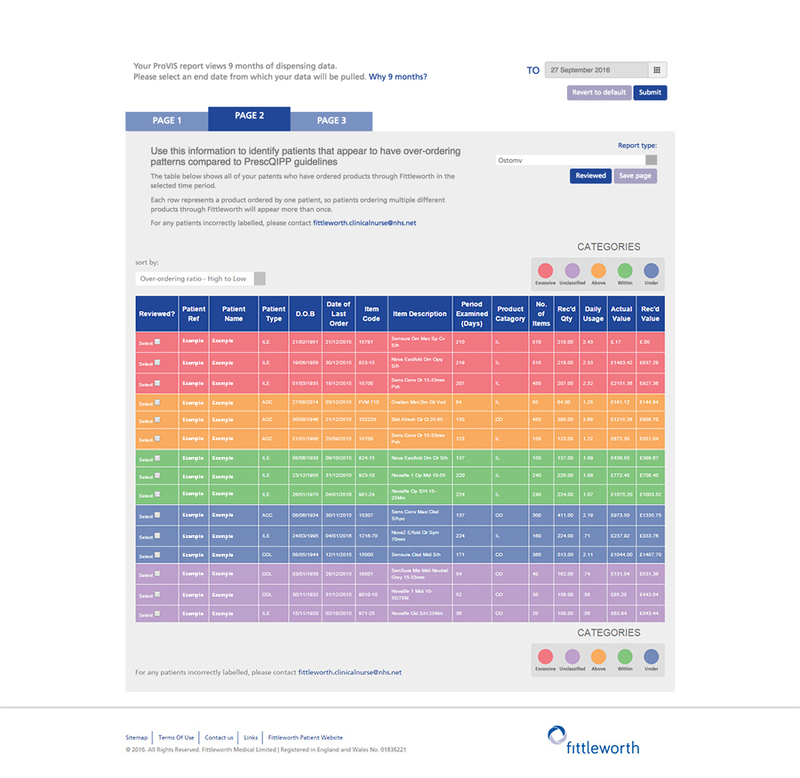 However, by using the gauge that compares current spend against the previous 9-month period, you can review how your CCG is progressing to reduce prescribing spend.